There’s an old adage that states, “You don’t grow in the gym; you grow the 23 hours outside the gym.” But of these other 23 hours, it’s the eight hours of sleep that account for the greatest growth and recovery potential. So what are you doing to maximize your muscle regeneration at night? If you’re smart, before you go to bed, you’re supplementing with CytoSport Sleeping Giant Nighttime Protein Supplement Mix with melatonin and tryptophan. This comprehensive growth potentiator provides the critical nutrients your body needs to support maximum anabolic growth and recuperation. Each serving of Sleeping Giant contains 30 grams of high-quality micellar casein protein. During sleep, growth hormone increases and cortisol levels decrease, which makes it the perfect time to provide protein since the muscles are primed. Sleeping Giant also offers a massive 1,100mg dose of trypto¬phan from all sources, which boosts anabolic sleep and keeps you in deep REM sleep patterns to promote growth hormone and testosterone release. To help you fall asleep faster and keep you in a deeper slumber, Sleeping Giant is reinforced with melatonin and magnesium. Of all the natural sleeping aids, melatonin is the gold standard, and Sleeping Giant contains an optimal 4mg dose per serving. In addition, magnesium promotes relaxation and enhances sleep quality, and Sleeping Giant provides 25% of the daily value of this important mineral. But Sleeping Giant isn’t done yet. It also has tart cherry powder, which may help reduce inflamma¬tion and has been shown to boost melatonin levels at night as well. At just 150 calories per serving, Sleeping Giant is the perfect anabolic shake to take at night. It is available in two delicious flavors, Hot Chocolate and Vanilla Caramel, to satisfy your sweet tooth. Better yet, you can mix it with cold or hot water, both of which are more satisfying and far more anabolic than a warm glass of milk. Simply drink a Sleeping Giant shake before bedtime and prepare to get the rest you need and the strength you are dreaming about. 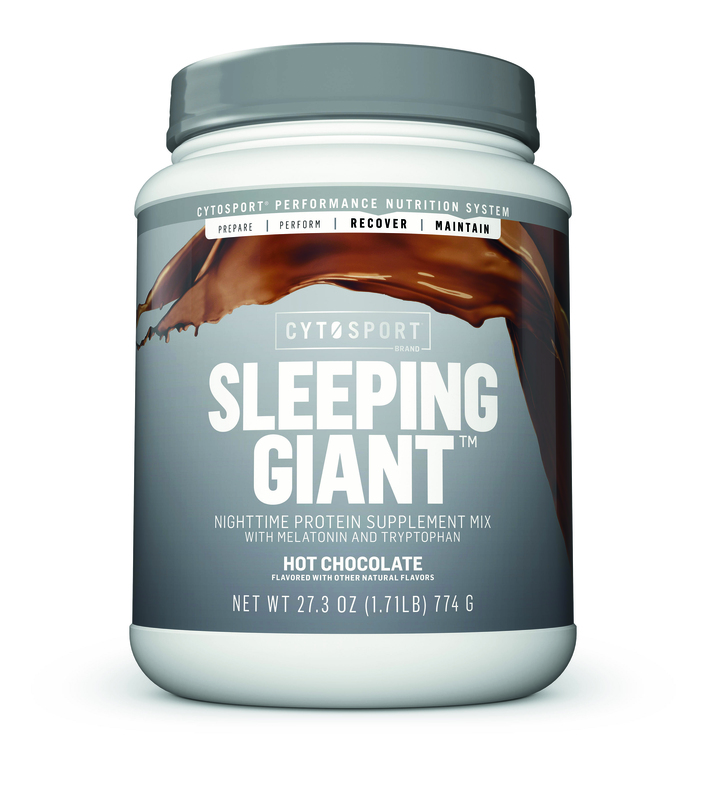 IN SHORT: CytoSport Sleeping Giant Nighttime Protein Supplement Mix contains 30 grams of micellar casein protein per serving. And it’s NSF Certified for Sport (free of banned substances).